I just got a part-time job at the Decatur Peer Support and Wellness Center, a place that believes in focusing on strengths, not illness; on hope, not fear; on compassionate peer support, instead of cold, clinical diagnosis. I believe in these things too. I feel like my possibilities are endless now. Here is Mark 5 and how I related the verses about the man living among the tombs to my own life. Mark 5 New International Version (NIV) Jesus Restores a Demon-Possessed Man 5 They went across the lake to the region of the Gerasenes. [a] 2 When Jesus got out of the boat, a man with an impure spirit came from the tombs to meet him. 3 This man lived in the tombs, and no one could bind him anymore, not even with a chain. 4 For he had often been chained hand and foot, but he tore the chains apart and broke the irons on his feet. No one was strong enough to subdue him. 5 Night and day among the tombs and in the hills he would cry out and cut himself with stones. I am like the man in the tombs and so are many others. Borderline personality disorder and schizophrenia are labels that scare many people. I have seen papers where psychiatrists and psychologists have called people with BPD “monsters” and it is common to see schizophrenia associated with violence in the media, when the truth is that people with mental illness are much more likely to be abused, scapegoated and bullied than to cause the violence themselves. Because of the stigma, I have felt that I could tell no one what I was going through and that there was no way that people could truly love or value me. This belief caused me to do desperate things in order to get my needs met. The good news is that the man in the tombs was healed and so was I. I believe he was healed by the bringing of him back into community, for it is community where we belong and it is community that we are healed. We need people and we need God-just as we are in a relationship with God, we are in a relationship with the world and our communities. It is a reciprocal relationship, as God and community have given so much to me, so I too have much to offer the world. 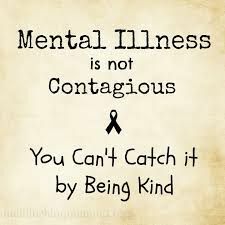 It needs to be recognized that people with mental illness, no matter how severe, have community value and the potential to change and grow. We all have value. We all have the ability to change and grow, just like Jesus and the man he healed, into our own resurrection and redemption.